I've never loved my bedroom. It has ranked high on the least-favorite-room list for most of my adult life. In college, I was trying so hard to get it right that I was getting it wrong. I used to tape magazine cut-outs (en masse) along my ceiling above my bed until they became a behemoth collage that used to unstick and droop constantly. 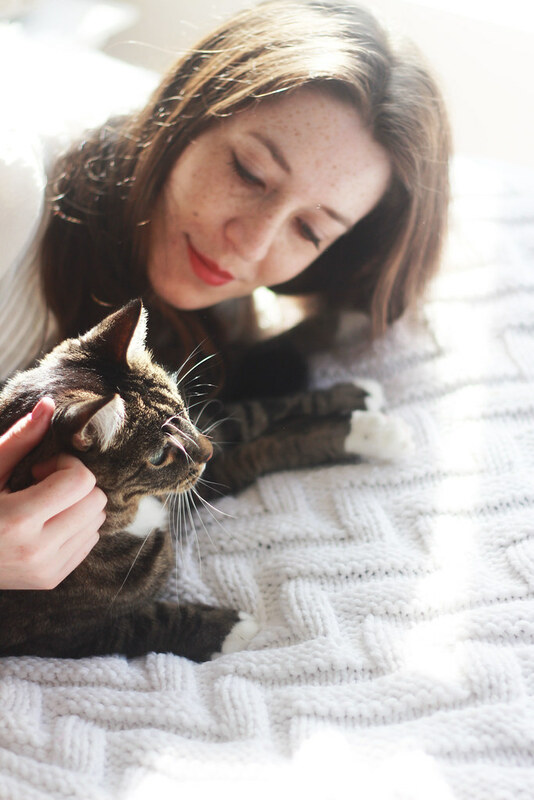 I remember running through cheap and never-warm-enough comforters and and duvet covers and cheap Target sheet sets and never quite feeling at home. One of the primary memories of my dorm room was the smell of university housing heat and microwave popcorn and general stuffiness. When Ben and I moved in together, we didn't have a bed frame. For two whole years. And we didn't even have a box spring for one of them. Our bed, on the floor, made the room look eternally "just moved into" and messy. The sheets drug on the floor. Our bedding rotated through a series of quilts - a patchwork quilt of Ben's and a deep grey quilt that I bought us a few years back. Entering our bedroom, it always felt mismatched and unreflective of the rest of the house. I hated that it wasn't a tranquil space to sleep and didn't seem to reflect me or the rest of our home decor. I used to throw my hands up and just leave the room on reorganization days. There was nothing to be solved. And then, Ben built me a desk. He built it for the corner of the room that had always felt messy and empty and where nothing quite fit. We used to keep a mismatched chair there and it collected clothes and clutter that didn't help the case. The white and pine desk, snug in the corner, just felt right. And I filled it up immediately. 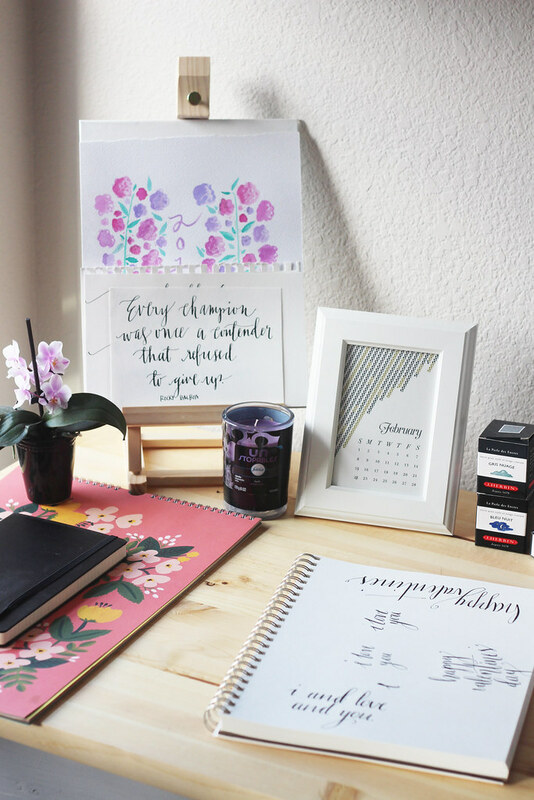 With my calligraphy work, with prints and calendars and photographs that feel special to me and with candles that smell fresh (like the one pictured above from the Unstopables line). 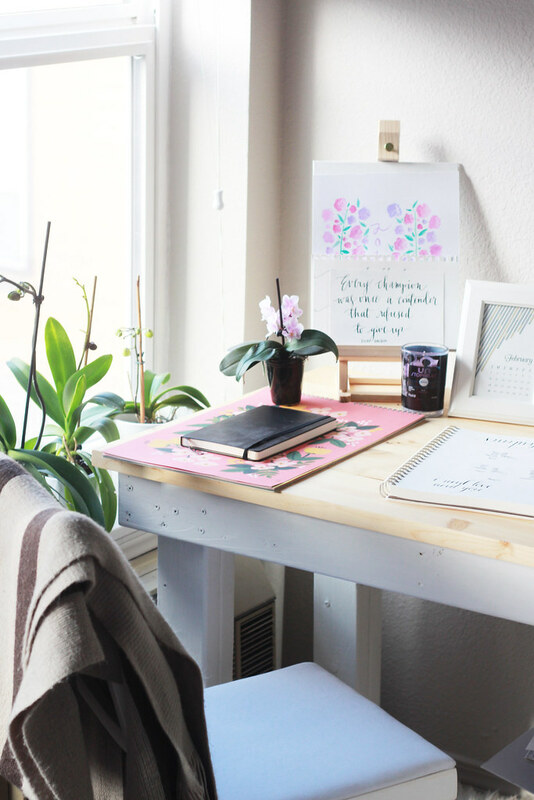 It echoes the rest of the room when its straightened up - light colors, beautiful papers, and calm. With the desk's transformative effect on the room, I used my Christmas money to buy a new comforter (down for those cold nights) and a new duvet cover in a gauzy white. The room instantly started to feel like a peaceful space for me to retreat to. Interior designer Nate Berkus suggests crisp white sheets (or in my case, a duvet cover) can make any bedroom feel like a luxe haven. I absolutely agree. In addition to adding white bedding to the room, I've added a scent profile to it as well - one of fresh laundry and clean sheets. There's nothing that feels so lovely as Sunday afternoons with clothing and sheets fresh out of the dryer and open windows. I've always associated those smells with lazy days and they make me feel at peace. I don't think I've played with smells ever before. 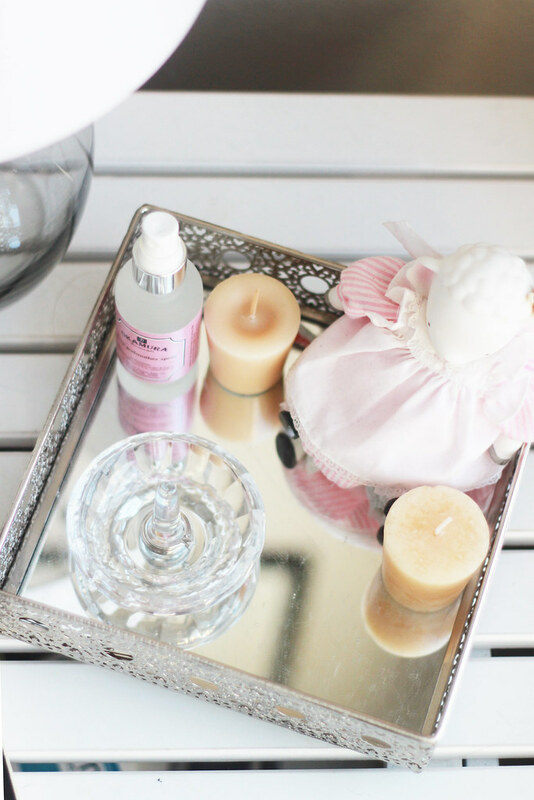 I've had a candle or two, but we usually use hypoallergenic lotions and scentless soaps, laundry detergents, and have forgone air fresheners. 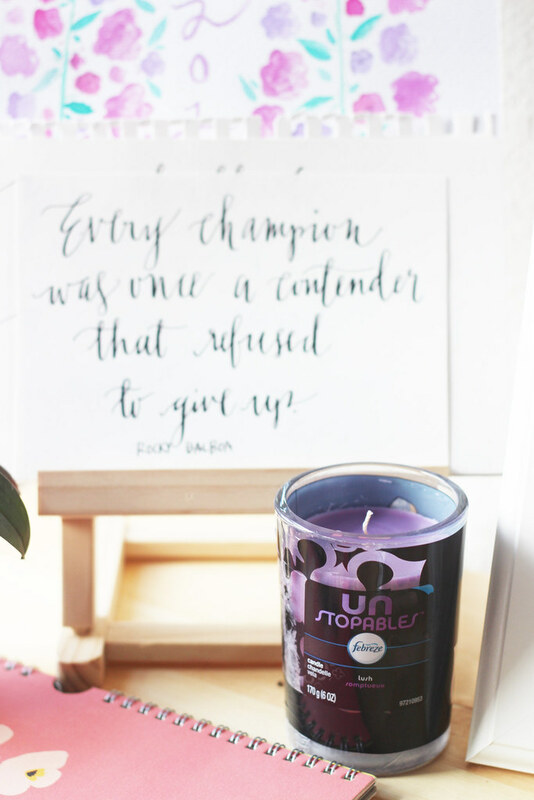 Adding the Unstopables line of products to my house - a scented oil warmer downstairs in the living room, in-wash scent booster and fabric refreshener on linens, and candles in the bedroom - has definitely relieved my stress and given our house the smell of a clean, freshly laundered home. 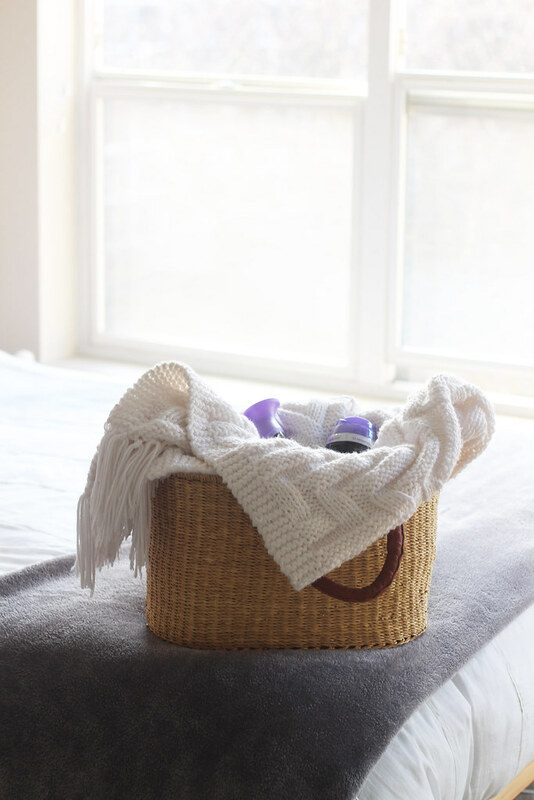 Walking in my door every day and smelling a fresh load of laundry and going to sleep without the smell of a stuffy upstairs room has created a scent-based feeling of peace. And your bedroom looks so nice. I've never played around with scents but all of these posts make me want to! 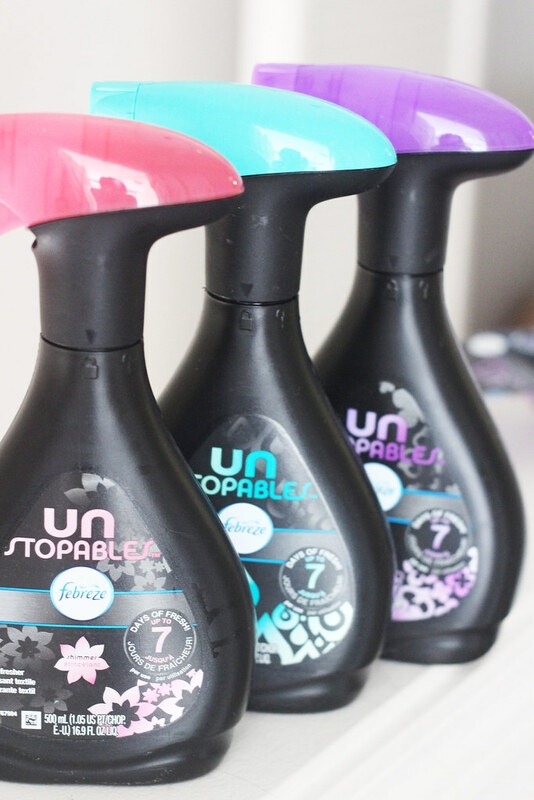 We use Unstoppables in the laundry and I love the nice scent they give to the sheets. I'll have to try a few of the other products in the line. Love the great photos. Odd to hear that your bedroom was always your least favorite place to me. As a self-professed hermit, that's the FIRST place I want to be comfortable. 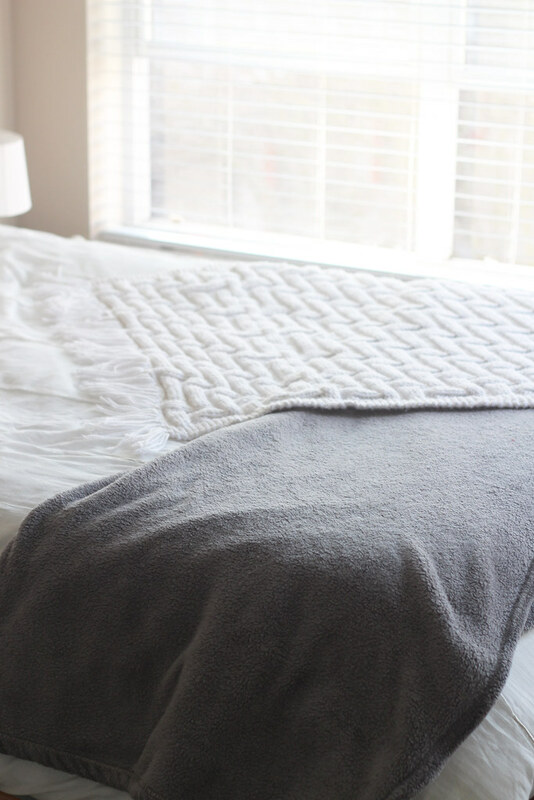 It ALL starts with the perfect comforter. (I have three.) Glad you found one that brought in the finishing touch. Lovely desk your man DIY'd, too. And that Balboa quote sells it. Wait, but how cute is archer?? Also. I am loving your shirt in this post!!! SO chic. You look great. Love the desk! Our room took the backseat to other rooms too. But once it was done, I love love it too. It's comfy and soft and cozy. I'm glad you love your now too! I love it when my house smells fresh and clean!! I've been wanting to try Unstopables but haven't yet, now I want to even more!! Your room is so peaceful and calm looking now! 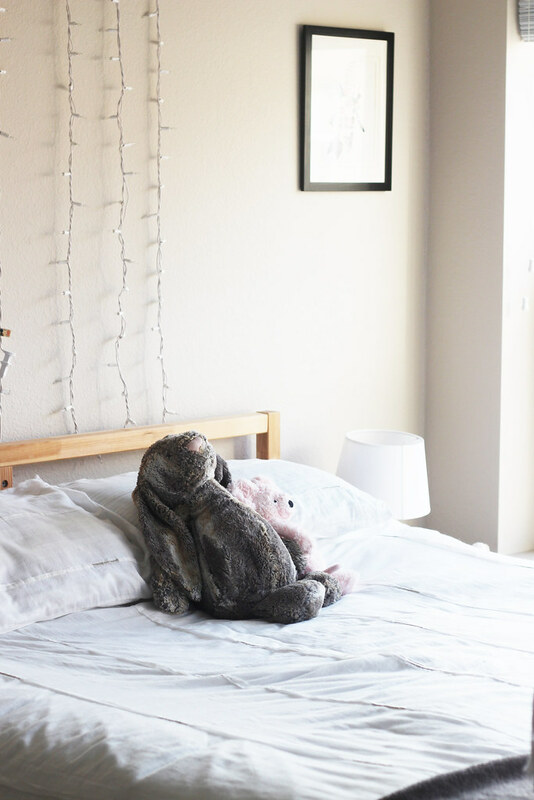 I've always loved bedrooms and constantly change the decor in mine, but nowadays I'm leaning more and more to simplicity - and I haven't used anything but white sheets in a while because they do feel and look so nice and fresh! You did such a great job putting this post together! Your photos are gorgeous! I love the light colors and the sun shining through the windows!